Working near the Temple Mount in Jerusalem, Hebrew University of Jerusalem archaeologist Dr. Eilat Mazar has unearthed the earliest alphabetical written text ever uncovered in the city. The inscription is engraved on a large pithos, a neckless ceramic jar found with six others at the Ophel excavation site. According to Dr. Mazar, the inscription, in the Canaanite language, is the only one of its kind discovered in Jerusalem and an important addition to the city's history. Dated to the tenth century BCE, the artifact predates by two hundred and fifty years the earliest known Hebrew inscription from Jerusalem, which is from the period of King Hezekiah at the end of the eighth century BCE. A third-generation archaeologist working at the Hebrew University's Institute of Archaeology, Dr. Mazar directs archaeological excavations on the summit of the City of David and at the southern wall of the Temple Mount. The discovery will be announced in a paper by Dr. Mazar, Prof. Shmuel Ahituv of Ben-Gurion University of the Negev, and Dr. David Ben-Shlomo of the Hebrew University, following their extensive research on the artifact. Prof. Ahituv studied the inscription and Dr. Ben-Shlomo studied the composition of the ceramic materials. 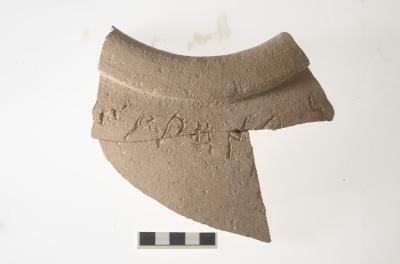 The paper, "An Inscribed Pithos From the Ophel," appears in the Israel Exploration Journal 63/1 (2013). This jar fragment from the time of Kings David and Solomon is the earliest alphabetical written text ever discovered in Jerusalem. Unearthed near Jerusalem's Temple Mount by Hebrew University archaeologist Dr. Eilat Mazar, it is dated to the tenth century BCE and bears an inscription in the Canaanite language. The text contains a combination of letters approximately 2.5 cm tall, which from left to right translate to m, q, p, h, n, (possibly) l, and n. The archaeologists suspect the inscription could specify the jar's contents or the name of its owner. The inscription was engraved near the edge of the jar before it was fired, and only a fragment of it has been found, along with fragments of six large jars of the same type. The fragments were used to stabilize the earth fill under the second floor of the building they were discovered in, which dates to the Early Iron IIA period (10th century BCE). An analysis of the jars' clay composition indicates that they are all of a similar make, and probably originate in the central hill country near Jerusalem. According to Prof. Ahituv, the inscription is not complete and probably wound around the jar's shoulder, while the remaining portion is just the end of the inscription and one letter from the beginning. The inscription is engraved in a proto-Canaanite / early Canaanite script of the eleventh-to-tenth centuries BCE, which pre-dates the Israelite rule and the prevalence of Hebrew script. Reading from left to right, the text contains a combination of letters approximately 2.5 cm tall, which translate to m, q, p, h, n, (possibly) l, and n. Since this combination of letters has no meaning in known west-Semitic languages, the inscription's meaning is unknown. The archaeologists suspect the inscription specifies the jar's contents or the name of its owner. Because the inscription is not in Hebrew, it is likely to have been written by one of the non-Israeli residents of Jerusalem, perhaps Jebusites, who were part of the city population in the time of Kings David and Solomon. 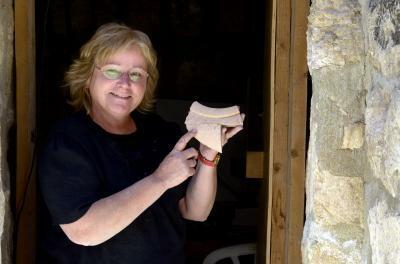 Hebrew University of Jerusalem archaeologist Dr. Eilat Mazar displays a jar fragment unearthed near Jerusalem's Temple Mount bearing an inscription in the Canaanite language. Dated to the tenth century BCE, it is the earliest alphabetical written text ever discovered in the city. The text contains a combination of letters approximately 2.5 cm tall, which from left to right translate to m, q, p, h, n, (possibly) l, and n. The archaeologists suspect the inscription specifies the jar's contents or the name of its owner.